2015 Land Pride SGC0548 for sale in Waterloo, NY. Empire Tractor, Inc.
Move brush, clean stalls, lift debris, and so much more with Land Pride’s all new SGC0548 Claw Grapple. The SGC05 will make chores a breeze. Easily grasp, lift, and move a variety of materials making property maintenance easier and less time consuming. 3/4" Pivot pins ; Large diameter pins for extra strength. AR400 teeth material; More than double the strength of mild steel. BX Third Function Valve Kit (Accessory) ; Can control all grapple and loader movements with a joystick. Provides easy hooking and unhooking of hydraulic hoses at the front of the loader. Designed to fit Kubota’s BX tractors with front loaders:; Easy to attach to Kubota’s BX tractor loaders with or without Kubota Original Quick Hitch. A good fit for Kubota BX tractors with front loaders. Designed to protect hydraulic hoses; Hydraulic hoses routed to prevent pinching. Dual hydraulic cylinders; Allows upper claw to grip the material better. 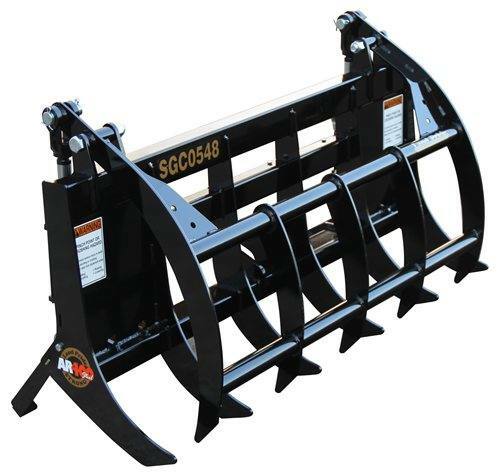 Extended Hitch Pins (Accessory) ; Allows the grapple to be hitched directly to the loader arms without purchasing Kubota’s Original Quick Hitch to make the connection. High volume cage design ; Can handle large volume of material. Teeth: Spacing: 9 3/8" ; Thickness: 1/4"
Working Length: of Teeth: 8 3/8"